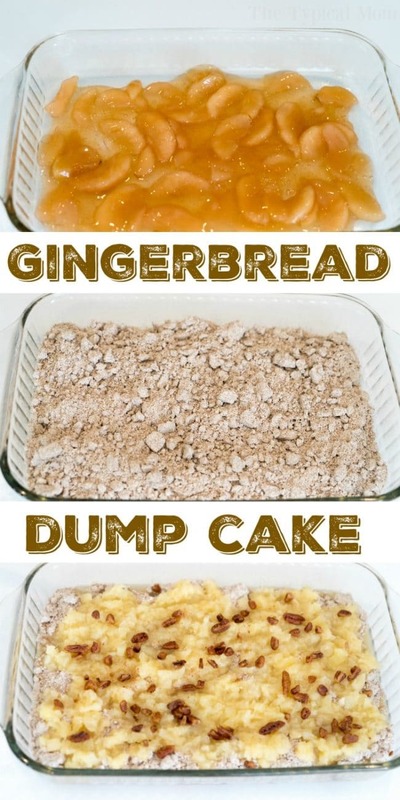 This gingerbread dump cake is moist and delicious with all the Christmas flavors you crave! Serve an easy gingerbread cake for brunch or dessert this year. 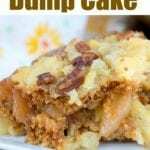 We are all about easy dump cake recipes here at The Typical Mom and now that the holidays are rolling around I thought this gingerbread dump cake should be added to the list! 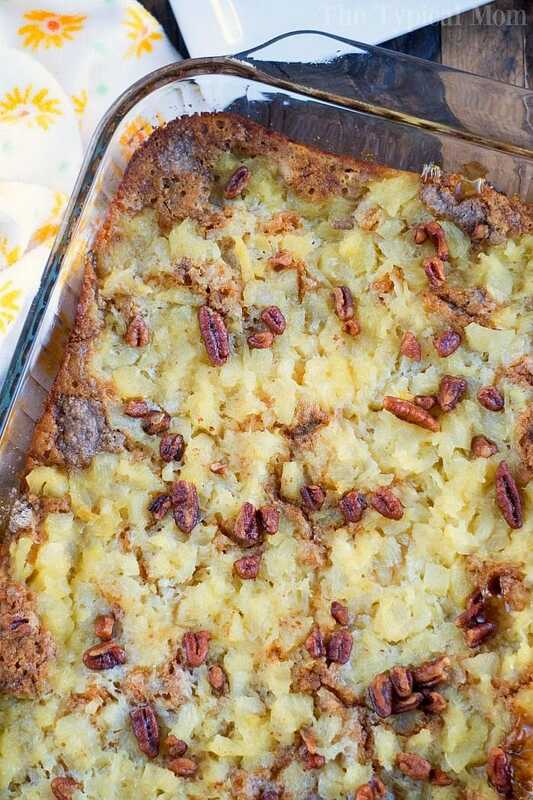 You’ll have to let us know what you think but I’d say it’s a great Christmas dessert that only requires 4 basic ingredients and you can whip up together fast!! Comfort food to the max let’s say. Here’s a quick peek at the process of making this easy gingerbread cake with apples. Like I said, dump cakes traditionally just use butter or layering of a can of pie filling + crushed pineapple. That is my go to method. I have made the traditional 3 ingredient dump cake recipe before where you just use cake mix, egg and a lot of butter but it isn’t my preference. That way comes out well…..very buttery and heavy to me, so most of my easy dump cakes have fruit and ie filling. 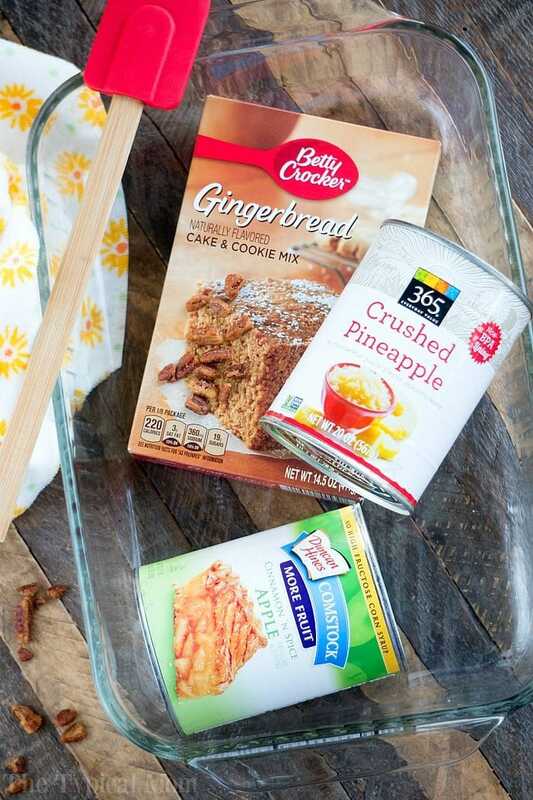 I thought apple and pineapple would compliment our gingerbread cake pretty well and my family agreed…but you could swap out the pie filling if you preferred. What if you don’t care for pineapple or cannot eat it? I have had a few people ask me this and my only suggestion would be to replace the can of crushed pineapple with another can of apple pie filling. I waited until the very edges of the cake peeking out looked done and was pulling away from the sides and then allowed it to cool on a cooling rack so the whole cake can solidify a bit more before scooping out. By all means if you are anxious and need dessert right when it looks like this and you pull your gingerbread cake out then scoop out immediately and serve!! It will just be a bit looser that way, that is all….but still delish!! Looking for more Christmas dessert recipes we have a few! Spray 13x9 pan with non stick spray. Pour apple pie filling into pan and spread evenly across bottom. Sprinkle dry gingerbread cake mix on top of that, spread evenly across pan. Dump crushed pineapple on top of mix, spread evenly across pan. Melt butter and pour on top, evenly. Sprinkle nuts on very top if you want to add those. Put into preheated oven at 350 degrees for 40 minutes or until edges are light brown, cake-like, and no longer wet. Allow to cool on a cooling rack to firm up a bit. Not crazy about apples what to substitute? I made this last week for a luncheon at work. I did not make it before to taste it, so I just crossed my fingers. Then the only gingerbread cake/cookie mix I could find was Hodgson Mills, which was a whole wheat mixture and possibly too heavy. Amazingly, this cake was delicious and perfect. Great recipe!!! So glad everyone loved it!! Do you drain the juice from the crushed pineapple or do you add the juice as well to the mixture? No do not drain the crushed pineapple. I am wondering also about what to replace the pinapple with- it is a areflux trigger in our family. Thank you! My initial thought would be to use 2 cans of apple pie filling, it will be a big heavier and may take a bit longer to cook because of the weight on top but if I were to make without that is what I would try. Can you replace/omit the pineapple? My daughter doesn’t like pineapple. Thank you. Love this easy recipe that totally transforms a cake box mix! Semi-homemade is awesome! 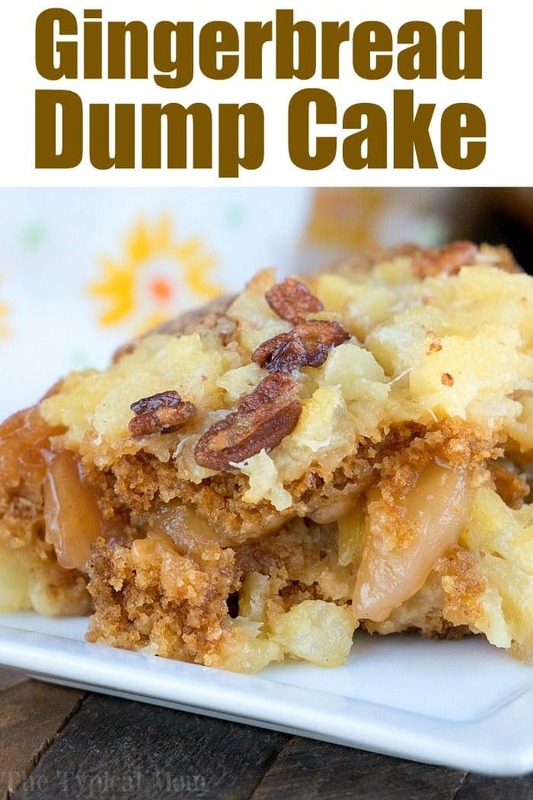 I am salivating over this scrumptious-looking gingerbread dump cake! I love how quick and easy it is to make.